"County of Renfrew" redirects here. For other counties, see Renfrew (disambiguation). Renfrewshire or the County of Renfrew (Latin: Praefectura Renfroana) is a historic county, registration county and lieutenancy area in the west central Lowlands of Scotland. The area is occasionally known as Greater Renfrewshire to distinguish it from the modern local authority area. For the purposes of local government, Renfrewshire is now divided into three council areas called Renfrewshire, East Renfrewshire and Inverclyde. The county borders the city of Glasgow and Lanarkshire to the east and Ayrshire to the south and west. The Firth of Clyde forms its northern boundary, with Dunbartonshire and Argyllshire on the opposing banks. Renfrewshire's early history is marked by ancient British and Roman settlement. Renfrewshire can trace its origin to the feudal lands at Strathgryfe granted to Walter Fitzalan, the first High Steward of Scotland. Robert III of Scotland, a descendant of Fitzalan, established the shire of Renfrew-based out of the Royal burgh of Renfrew, the site of the House of Stuart's castle and Renfrewshire's county town. During the Industrial Revolution, many of the larger towns became important centres of commerce and manufacturing. The goods produced were chiefly cottons, calicos and silks building on the county's long weaving heritage. Other industries such as ship building, distilleries and printworks also contributed to the economy. At this time, Paisley was the largest urban and commercial centre in the county by some margin. This distinction saw the emergence of local government focused in Paisley, rather than the county town of Renfrew. Paisley remains the administrative centre of the Renfrewshire council area. Parts of the county, such as Govan and Nitshill were incorporated into Glasgow during the early 20th century as the city expanded. Renfrewshire was superseded by the Strathclyde local government region in 1975, until its abolition in 1996. The modern unitary council areas in the county - Renfrewshire, East Renfrewshire and Inverclyde - were formed as districts within the Strathclyde region (although not with the same boundaries or - in the case of East Renfrewshire - the same names as the later authorities). Renfrewshire's origins lie in the religious authority over the Strathgryfe area granted to Paisley Abbey by Walter Fitzalan. However its history goes back further, with ancient Roman and Brythonic heritage. The earliest evidence of human activity in the area is traces of an Iron Age fort in the Busby area and a pre-Roman settlement in Overlee. When the Romans advanced in the year 80 from the Solway Firth, the territory that would later become Renfrewshire was occupied by the Damnonii, a British tribe. The principal Roman stronghold in the area was at Vanduara (Paisley). Following the end of Roman rule in Britain in 410, the Cumbrian Britons, with their capital at Dumbarton, retained a hold on all the territory west of the Lothian — the Kingdom of Strathclyde. During the High Middle Ages, Strathclyde was conquered by the Kingdom of Alba, which in turn developed into the Kingdom of Scotland. In the 12th century, during the reign of David I of Scotland, Walter Fitzalan fled the English county of Shropshire due to "The Anarchy" between Empress Matilda and Stephen. Walter rallied to the support of the Empress, but when her cause was lost, Walter befriended David I, King of Scots who was an uncle of Matilda, and became, David's Dapifer or Steward. Accompanied by his brother Simon, Walter came to Scotland about 1136 and fought for Scotland at the Battle of the Standard at Northallerton in 1138 under the command of David I's son, Prince Henry. Fitzalan settled in Scotland and was appointed by King David I as the first High Steward of Scotland and was granted the lands of Strathgryfe - what would eventually become Renfrewshire. In 1163 Walter founded, first at Renfrew but shortly afterwards at Paisley, a house of monks of the Cluniac order drawn from the priory of Much Wenlock, in his native county of Shropshire. The monastery steadily grew and by 1219 became Paisley Abbey. Fitzalan's descendants would eventually become the powerful House of Stuart. As the influence of the Stewarts of Renfrew - the family holding the High Stewardship - grew, the status of the area was gradually increased. In 1371, Robert Stewart was crowned King of Scotland and in 1402 his son, Robert III established the shire of Renfrew crafted from territory previously within the shire of Lanark and based out of the town of Renfrew, the site of the Stewart's castle. From this point onwards, the county has been closely tied to the monarchy and the heir apparent to the British monarch, currently HRH The Prince Charles, holds the title of Baron of Renfrew. It is traditionally believed that Sir William Wallace, a knight and military leader during in the period surrounding the Wars of Scottish Independence, was born in 1272 at Elderslie in the county. Prior to the 1890s, county-level local government was conducted by a number of officials, chiefly the county's Commissioners of Supply. Historically, the counties also overlapped with sheriffdoms, the Sheriffdom of Renfrew being mentioned specifically as the territory covered in the pre-Union Parliament of Scotland's legislation creating the Commissioners of Supply in 1667. As such, the judicial roles of the Sheriff often overlapped with executive government of counties. Renfrewshire's Commissioners of Supply met at Renfrew, as the county town, along with the Quarter Sessions and freeholders of the county. The sheriff court also met at Renfrew until 1705, when it was moved to Paisley. Following the Local Government (Scotland) Act 1889, Renfrewshire - as with the other counties of Scotland - gained greater powers and became governed by an elected county council, a position that remained until 1975. The centre of local government was moved from Renfrew to Paisley. Commissioners of Supply continued to exist with much reduced powers following the 1889 Act, until they were abolished by the Local Government (Scotland) Act 1929. During this time, a significant portion of eastern Renfrewshire became absorbed into the growing City of Glasgow, such as the Parish of Cathcart, parts of the Parish of Govan, and parts of the Parish of Renfrew lying north of the River Clyde (containing Yoker, Scotstoun and Jordanhill). Renfrewshire was significantly involved in the Radical War of 1820, with many of the local industrial workers participating in the rioting and strikes. In the Second World War, Renfrewshire suffered due to its shipbuilding industries on the banks of the River Clyde. Heavy bombing was inflicted over the 6th and 7 May 1941 in an event referred to as the Greenock Blitz. On 10 May 1941, Rudolf Hess, a leading official in the government of Nazi Germany, parachuted into a field near Eaglesham on a secret mission to meet Douglas Douglas-Hamilton, 14th Duke of Hamilton for peace negotiations, and was instead arrested by a farmhand with a pitchfork and imprisoned. It is believed Hess was privately distressed by the war with the United Kingdom as he had hoped that Britain would accept Germany as an ally. Hess may have hoped to score a diplomatic victory by sealing a peace between the German Reich and British Empire. Following the Local Government (Scotland) Act 1973, Renfrewshire was incorporated into the Strathclyde region and divided amongst three districts: Renfrew District, Eastwood District and Inverclyde District. The Act created a two-tier local government structure, with both districts and regions having elected councils and sharing responsibility for local government. The Local Government etc. (Scotland) Act 1994 abolished district and regional councils, replacing them with the current unitary council areas which in Renfrewshire were broadly based on the districts created by the 1973 Act. These local government areas are Renfrewshire, formed from Renfrew District; Inverclyde, formed from Inverclyde District and East Renfrewshire formed from Eastwood District. The James Watt College building in front of the Victoria tower of the Municipal buildings, formerly of the Burgh of Greenock - Renfrewshire's second largest settlement - both now used by Inverclyde Council. the remaining smaller settlements, known as "landward" areas, e.g. Bishopton and Clarkston, had responsibility for parks and recreation only. The County Council formerly met in the County Buildings, a Gothic style constructed in County Square in Paisley c.1817 and demolished in the 1960-70s. New County Buildings were constructed in 1890 on Paisley's St James's Street in the Classical style and are now used to house Paisley's Sheriff Court. The County Council Chamber is now Court 8 within the building. Aside from burghs and parishes, the county was subdivided between a number of higher tiers of local government during certain points in its history. Between the 1880s and the early 20th century, it is recorded that the county is divided between an 'Upper Ward' consisting of the eastern two-thirds of the county centred on Paisley, and a 'Lower Ward' approximating the boundaries of the modern Inverclyde council area and consisting of the parishes of Inverkip, Greenock, Port Glasgow and Kilmacolm, with Greenock as district centre. Whilst no longer used as a local authority area, Renfrewshire remains used for ceremonial purposes as a Lieutenancy area. The Lord Lieutenant and a number of Deputy Lieutenants represent Her Majesty the Queen in the county, performing a number of ceremonial functions and arranging and co-ordinating Royal visits. The incumbent Lord Lieutenant of Renfrewshire since 2002 is Mr Guy Clark and the Vice Lord Lieutenant is Mrs Susie Stewart of Neilston. Mr Clark is a stockbroker and Justice of the Peace from Inverkip. The Renfrewshire lieutenancy operates out of the headquarters of East Renfrewshire Council in Giffnock. The County of Renfrew is a registration county used for land registration under the authority of the Land Registration (Scotland) Act 1979. For this purpose, the county includes several areas annexed to and subsequently enveloped by neighbouring Glasgow in the 1920s. The county is still often used in postal addresses. The county was the first to introduce the new Land Register of Scotland on the 6 April 1981. For a number of purposes, the three modern local councils in the county co-operate on a number of matters. Renfrewshire is retained as a Joint Valuation Board area, which values properties for the purposes of council tax and non-domestic rates, and is also used for electoral registration. Councillors from the three local councils also join together, in association with other local groups, to form the Renfrewshire Education Trust which makes educational-related grants in the county. There is a Renfrewshire Civil Contingencies Service, the first civil contingencies planning body in Scotland to adopt the shared services model of co-operation between local authorities. Central government bodies also use the historic boundaries of the area for some purposes. 'Scottish Enterprise Renfrewshire', a non-departmental public body accountable to the devolved Scottish Parliament which encourages enterprise and economic development, covers the three modern council areas in the county. Renfrewshire was officially a postal county used for administrative purposes by Royal Mail. Whilst this system has not been used for sorting mail since 1996, Royal Mail still keeps and distributes data relating to postal counties in the United Kingdom. Following the Act of Union 1707, which created Great Britain as a sovereign state, Renfrewshire was a county constituency for elections to the House of Commons in Parliament. The town of Renfrew was not included in the county constituency, being a parliamentary burgh, and from 1832 the other burghs of Greenock, Paisley and Port Glasgow were similarly excluded. Following the Redistribution of Seats Act 1885, Renfrewshire was mainly divided into four constituencies . These were the county constituencies of East Renfrewshire and West Renfrewshire; and the burgh constituencies of Paisley and Greenock. From 1832, Port Glasgow and Renfrew had been part of the Kilmarnock Burghs constituency and remained as such, only being absorbed into West and East Renfrewshire respectively in 1918 with the passage of the Representation of the People Act 1918. The distribution of seats remained generally stable during Renfrewshire's time as an administrative county. In 1974, the constituency of Greenock was abolished and joined with Port Glasgow to create the constituency of Greenock and Port Glasgow. With counties abolished for local government purposes, more wholesale reform of the constituency system in Scotland occurred in the 1980s, following the Third Periodic Review carried out by the Boundary Commission for Scotland, and a number of alterations were made before settling on the present system for the 2005 General Election laid out in the Fifth Periodic Review. Today, two of the three local council areas in the County of Renfrew have a single constituency: East Renfrewshire and Inverclyde, whilst the Renfrewshire council area is divided into the constituencies of Paisley and Renfrewshire North and Paisley and Renfrewshire South. Generally consisting of low moorland, there are a number of higher areas in the county such as the Renfrewshire Heights. The land slopes downwards to the side of the River Clyde. The main draining rivers of the area are the River Cart (formed by the White Cart Water and Black Cart Water) and the River Gryffe, all of which eventually flow into the River Clyde. The upper scenery of the county was described in the 1911 Encyclopædia Britannica as "somewhat wild and bleak" though descending into pastureland around the rivers. The geology of the Renfrewshire is notable for its volcanic origins. The traditional industries of Renfrewshire were noted for their variety and diversity. Weaving and associated trades were common in the county and Paisley became particularly notable for this industry. The Paisley pattern remains a symbol of the area and its weaving past to this day. Shipbuilding on the River Clyde, particularly at Renfrew and Port Glasgow became significant in the later part of the 19th century and some of this industry remains to this day. Sugar refining, foundry-work, rope-making, machine-making, mineral work and the manufacture of chemicals are all noted as significant to the economy of Renfrewshire in the 1880s Gazetteer for Scotland entry, with the central areas for commerce noted as being Greenock and Port Glasgow. The coat of arms of Renfrewshire was granted to the county council in 1899. The galley is taken from the arms of the county town, Renfrew, with the arms borne being those of the House of Stewart, who originated in the area. The blazon of the arms is "Azure; a lymphad, sails furled, argent, on a shield or, pendent from the mast, a fess checky azure and argent". In 2002, the charity Plantlife organised a UK-wide competition to categorise county flowers, of which Renfrewshire's is unofficially the Bogbean. The Paisley pattern is used as the logo of Renfrewshire Council, one of the three modern local authorities in the county. There is a Renfrewshire tartan 'for use by anyone from or associated with the County of Renfrewshire' recorded on the official Scottish Register of Tartans. There are two professional association football teams in the county, Paisley's St Mirren F.C. and Greenock Morton F.C.. Both compete annually for the Renfrewshire Cup. Four rugby football teams compete in the Renfrewshire Tournament - Paisley, Renfrew, Bishopton and Birkmyre (Kilmacolm). Renfrewshire houses five extant King George's Fields, part of a network of playing fields given to the memory of George V of the United Kingdom. Lochwinnoch, one of the larger villages in the central area of the county. Gourock in the west of the county, on the Firth of Clyde. 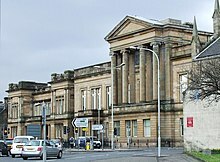 In modern times, the chief settlements in Renfrewshire have been the towns of Paisley and Greenock and to this day they retain their status as the county's largest and second largest towns respectively. In the late 19th century, the county was subdivided into two wards centred on these towns, the Upper Ward (Paisley) and Lower Ward (Greenock). Renfrew was the only town in the county to hold status as a royal burgh. Three other considerable towns, Paisley, Greenock and Port Glasgow, were designated as parliamentary burghs. Barrhead, Pollokshaws (now part of the City of Glasgow), Gourock, and Johnstone were, during parts of the 19th and 20th century, police burghs as a result of their larger population, giving greater powers of local governance to local burgh authorities. The county also contains a number of significantly sized villages, such as Kilmacolm, Neilston and Lochwinnoch. These administrative separations are entirely extinct, with unitary councils in Renfrewshire's three modern council areas - Inverclyde (West), Renfrewshire (Central) and East Renfrewshire - holding full statutory powers of local government. Many of these settlements continue to be represented by community councils, sponsored by the local authority, albeit without any distinct powers. ^ "Scran ::: PRAEFECTURA RENFROANA Vulgo dicta BARONIA". Scran. ^ "Sorry, the page you're looking for is not available. - E..." www.eastrenfrewshire.gov.uk. Retrieved 21 August 2018. ^ Professor Geoffrey W. S. Barrow, The Anglo-Norman Era in Scottish History, Clarendon Press, Oxford, 1980, ISBN 0-19-822473-7 page 64-5, where it is stated that Walter son of Alan came to Scotland about 1136 and served as "dapifer" or Steward successively to kings David I, Malcolm IV, and William the Lion. ^ ^ Watson, "Sir William Wallace", p. 27; Grant, "Bravehearts and Coronets", pp. 90–91. Chisholm, Hugh, ed. (1911). "Sheriff" . Encyclopædia Britannica. 24 (11th ed.). Cambridge University Press. pp. 848–850. ^ "Govan". Gazetteer for Scotland. ^ "Parish of Renfrew". Gazetteer for Scotland. ^ Galland, Adolf (1954). The First and the Last: The Rise and Fall of the German Fighter Forces, 1938-1945 (1968 Ninth Printing - paperbound ed.). New York: Ballantine Books. p. 56. ^ "Doors Open Days Scotland 2018 - Get into buildings!". Doors Open Day. Retrieved 21 August 2018. Chisholm, Hugh, ed. (1911). "Renfrewshire" . Encyclopædia Britannica. 23 (11th ed.). Cambridge University Press. pp. 98–99. ^ a b c d e "Old County of Renfrewshire". ^ "Renfrewshire Lieutenancy :: People". ^ "Renfrewshire's new vice-lord lieutenant". Herald Scotland. ^ "Lord-Lieutenants of Scotland". Retrieved 21 August 2018. ^ "iBooked.co.uk - Top cultural European holiday destinations". iBooked.co.uk. ^ Scotland, National Records of. "Tartan Details - The Scottish Register of Tartans". www.tartanregister.gov.uk. Retrieved 21 August 2018.